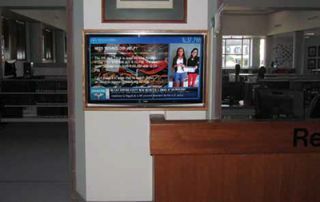 The digital signage system at The Hill School is a campus-wide deployment with displays mounted in the administrative offices, admissions office, head master’s office, dining hall, student center, student grill, library lobby, center for the arts, and athletic department. POTTSTOWN, PA—The Hill School is a preparatory boarding school for boys and girls located in Pottstown, PA. Established in 1851, The Hill values its history and traditions, but recognizes that to thrive today, it must also have an energetic level of innovation on campus and in the classroom. Before the 2013-2014 school year, The Hill School embarked on a massive technology upgrade that included presentation systems for all the classrooms, iPads for students, and the installation of a campus-wide digital signage system based on CastNET Content Management System (CMS) software. The solution provided by IMS is a CastNET Cloud system, which means that the digital signage server is located and maintained at CastNET’s secure off-site data center. CastNET Cloud is a cost-effective solution, since a long-term investment in server hardware is not required. The system has two channels; one channel is used by the library and all the other departments use the campus-wide channel. The screen layout for the campus-wide channel has a main content frame that shows scheduled messages, a bottom frame running the CastNET NewsJET scroll, and a right frame for announcements and weather. Shinn added, “IMS Technologies was successful in this installation because we made sure to operate as a team with the in-house electricians, in-house carpenters, and the data subcontractors who knew the facilities better than us.